Amid an ongoing wave of mixed-use and high-density housing projects coming to San Luis Obispo, the SLO City Council gave initial approval on Tuesday to another planned development, this one consisting of nearly 250 small to mid-sized apartments, as well as commercial space. 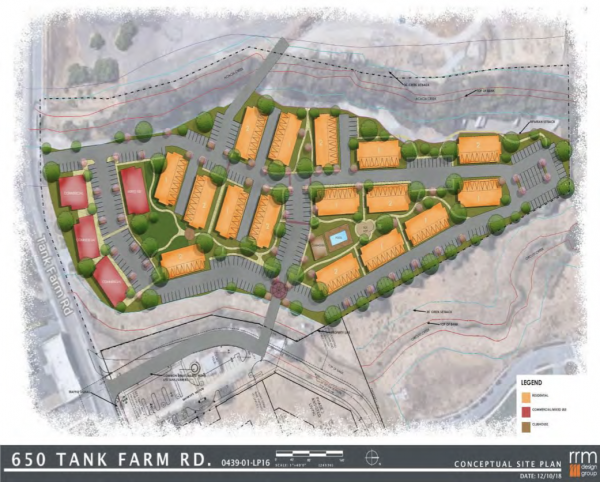 Area Grove Investments LLC is proposing constructing 13,530 square feet of residential space and 17,500 square feet of commercial space on a 12.75-acre lot at 650 Tank Farm Road, close to Broad Street. The property is currently occupied by a mobile home park and an RV storage location. Project plans call for 249 rental units, which would consist of 149 two-bedroom apartments, 50 single-bedroom apartments and 50 studios. The project also includes a pool, clubhouse and recreational space. There would be 16 residential buildings and four mixed-use buildings. Of the 12.75 acres that make up the property, 2.65 acres would remain open space. The 13 current tenants of the trailer park would receive priority for renting units that would replace the mobile homes currently on the site. The new apartments would be leased at both market and “affordable” rates. On Tuesday, the San Luis Obispo council unanimously approved general plan and Airport Area Specific Plan amendments that would allow for converting the property from a mobile home park to a mixed-use development. The council also introduced an ordinance on rezoning the property. Project plans could still change. The city planning commission has yet to approve a use permit for the project and the architectural design of the development.